The Jefferson High School Community Gym . . . It was February the sixth in Jefferson, Georgia. The Jefferson High School boys and girls basketball teams hosted cross-county rival East Jackson in the regular season finale for both teams. It was "Senior Night". It was also a night when the Jefferson High School gym, built in 1951 was officially retired from active high school sporting events. Former players from the 50s to the 2010s showed up to show their respect for all the many years of service that the $150,000 community purchased building had rendered to the youth of Jefferson over the past 64 years. Several former players from that 1951-52 school year that played on the basketball team were in attendance. They were introduced and stood with honor at center court where they were joined with other former players that came after them. The Dragonettes had a tough season that 51-52 season as they went winless for the season. A young lady named Dot Cook led the team in scoring with a 20-point per game average. It was Dot Cook that scored the first Jefferson basket in the gym of 1951. Not just for Jefferson, but the very first basket period. The following season she would lead the Dragonettes to a 15 win season and average over 25 points per game. The second leading scorer on the team was Sara Barnette, whom we all later knew as Coach Sara Gee. For most of my high school years I had heard that Y. D. Maddox had scored the first basket for the boys team against Gainesville in that gym debut in 1951. I asked Y. D. about this sometime around 1997-98 and he told me he did not score the first basket for the team in that particular game. He pointed out that he did assist on the first score. He said he had taken a pass around mid-court and saw Billy Sailors flashing toward the basket. He said he passed the ball to Billy and he scored on a layup for the first Dragon basket in the "Gym of 51". 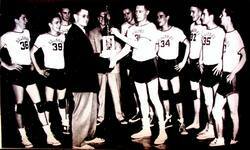 The boys team in 1951-52 went on to win their sectional and finished runner-up in the district. Their over-all record that year was 14 - 13. Now there probably won't be any more history making memories produced out of the old gym. However, after 64 years I would think there have been enough thrills and excitment to last most people a life-time. I, like many people of Jefferson, are glad the old gym will not be demolished. Too many of our old structures have been lost as we move forward on the road called progress. So long old gym friend! It was an honor spending so much time on your floor as I grew up. Many, many women and men of Jefferson will always feel that same way about you . . . you will never be forgotten! The Jefferson High School Community Gym. The gym was built with donations from the community. It's cost was $150,000. 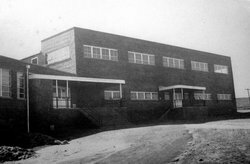 At the time it was a state of the art building that was popular for high school tournament and community recreation events. The 1951 – 52 Jefferson Dragons . . . L – R – Charles Middlebrooks, Sidney Johnson, Charles Barrett, Coach John Davis, Coach Billy Henderson, John Anderson, Billy Sailors, Franklin Shumake, Davis Roberts, Y. D. Maddox and Marvin Hall. Team captains were Charles Barrett and Billy Sailors. Billy Sailors scored the first basket for the Jefferson boys in the Gym of '51. Board Of Education chairman Ronnie Hopkins, Dr. Franklin Shumake, Davis Roberts, Mrs. Roberts, Don Cole, Coach Sarah Barnett Gee, Shirley Shaw Greeson , Merle Satterfield Thompson. Dr. Franklin Shumake and Davis Roberts of the 1951~52 Jefferson Dragons basketbll team. Mrs. Davis Roberts and Don Cole. Don Cole still holds the jefferson track record at 10.0 seconds. He has always been the fastest Dragon of all time. His record was set in 1951 in the state track and field meet where he won the 100 and 220 yard dash. Mrs. Sara Gee and Shirley Shaw Greeson. 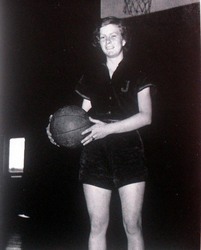 Coach Gee ( Sara Barnette ) was the captain of the first girls team to play in the gym of 151. Shirley Shaw Greeson and Merle Satterfield Thompson of the 51-52 Dragonettes. Ronnie Hopkins enjoying the company of Dr. Franklin Shumake. Dr. Shumake played on the 51-52 Dragons. Looking across the gym at the upstairs stands. At one time both home and visitor stands were high above floor level. The gym of 1951 was considered on of the finest facilities in the area. Jefferson regularly hosted various class B and C sectional and region tournaments. The scoreboards on each end of the floor has seen a lot of points and wins for the home team over the years. The old gym will continue to stand as a monument to the people of Jefferson that shared the cost of construction way back in 1951. 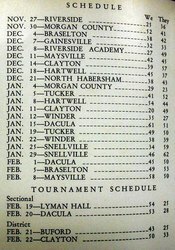 The schedule of the 1951-52 Jefferson Dragons in their first season in the Gym of 1951. . The 1951-52 Dragons won their sectional and were defeated in the second game of the district tournament. The 2015 Lady Dragon's joined them at the center of the court . Tom Healan served as the announcer during the tribute. A tribute was held between the boys and girls game with the 1951-52 players moving to the center of the gym. Dot Cook ~ A Jefferson junior forward scored the first basket of the game in the first 2 minutes of play for the first basket by boy or girl in the Gym of '51 dedication game with Gainesville on December 7, 1951. 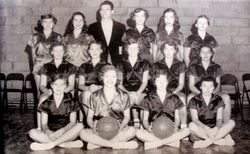 Dot Cook would average over 25 points per game in 1952-53, She attributed her improved play from the previous season to Jefferson Athletic Director Patsy Evans teaching her a jump shot during pre-season practice. Patsy Evans article from the Jackson Herald in January of 1953. Click to enlarge, then click again for best reading view. It was indeed an honor when Guy Dean Benson asked me ( Cecil Buffington ) to have a picture taken with the 1951-52 Gym Of '51 basketball players. These people are Jefferson legends and will forever be a part of Jefferson history for their participation in that first gym dedication game. Guy Dean serves on the very active school board and has been a close friend for over 50 years. Thank you, Guy Dean! Lady Dragons last game in old gym pre-game introductions. Looking across the floor at the Jefferson Home Stands. Lady Dragons Coach Jason Gibson issues final instructions to his team at last girls game in the Gym Of '51.